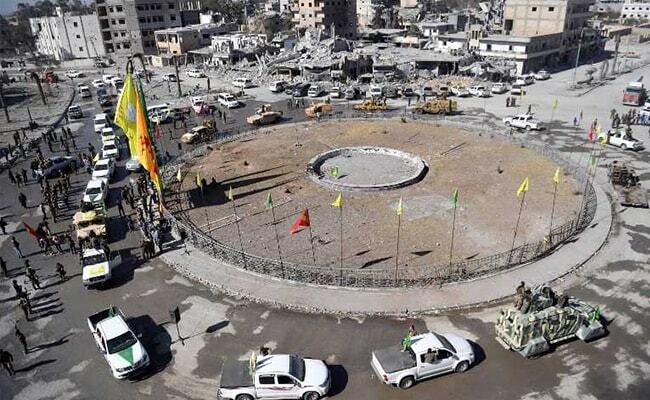 Three days after fully retaking the northern city, once considered the inner sanctum of the terrorists' now moribund "caliphate", the Syrian Democratic Forces held an official ceremony in a stadium to mark their win. Raqa: The Kurdish-led force that expelled the ISIS terror group from Syria's Raqa hailed a "historic victory" Friday in the devastated city and vowed to hand power to a civilian administration. But the group stopped short of transferring authority to the Raqa Civil Council because it said ordnance needed to be removed before the city could be left in civilian hands. SDF spokesman Talal Sello, speaking in front of a modest crowd of fighters and council members, said this week's victory against ISIS was dedicated to "all humanity". For three years, Raqa saw some of ISIS' worst abuses and grew into one of its main governance hubs, a centre for both its potent propaganda machine and its unprecedented experiment in jihadist statehood. On Friday SDF fighters stood guard on rooftops overlooking a city reduced to a grey wasteland of crumbling concrete buildings and dusty roads lined with the wrecks of cars. "The streets and alleyways of Raqa are filled with mines" planted by ISIS, said RCC co-chair Laila Mustafa. After losing a string of major strongholds in Iraq and Syria, the "state" the terrorists proclaimed in 2014 has shrunk to barely a tenth of its original size and the loss of Raqa has hammered yet another nail in its coffin. At the ceremony in a stadium where the terrorists made a desperate last stand earlier this week, Sello vowed the US-backed SDF would soon transfer power. "After the end of clearing operations... we will hand over the city to the Raqa Civil Council," he said. He said the SDF would maintain its presence in the area and reiterated the Kurdish-Arab alliance's support for a federal system in Syria, something the regime in Damascus has so far opposed. The US-led coalition against ISIS hailed the capture of Raqa, along with the former terror bastion of Mosul in Iraq, as "turning points for the terrorist organisation whose leaders grow ever more distant from a dwindling number of terrorist adherents". "Raqa was a key location for Daesh's (ISIS) planning, financing, execution, or inspiration of terrorist activities throughout the world, including attacks in Paris, Brussels, Nice, Manchester and many others," it said. French Foreign Minister Jean-Yves Le Drian said Raqa's fall meant that the devastating November 2015 attacks in Paris had "not gone unpunished". "I was very moved by this victory -- which has not been achieved definitively, but is under way -- because everyone knows that it was from Raqa that the orders came, the decisions were made, the perpetrators of the attacks in France came," he said. "So the crimes of the Bataclan have not gone unpunished," he said, referring to the venue where ISIS terrorists massacred 90 concert-goers in November 2015. Raqa was heavily damaged during more than four months of fighting, which the Syrian Observatory for Human Rights said left more than 3,200 people dead, including 1,130 civilians. Ahmed al-Ali, a 31-year-old member of the RCC's reconstruction committee, expressed shock at discovering the extent of the destruction. "Today is the first time I've come to the city since its liberation," he told an AFP reporter. "I haven't managed to get to my house on Al-Qitar street. I'd pay half a million dollars just to see its door," he added, breaking into tears and walking away. One of his colleagues, Mahmud Mohamed, admitted that his idea of what reconstruction would entail changed the second he entered Raqa. "When we came into the city, the plan changed completely. What I had imagined..." the 27-year-old paused. "It's so much worse." The mood was sombre among council members as they sat quietly on plastic chairs while SDF fighters danced and sang noisily behind them. Several representatives of Raqa tribes, on entering the stadium and seeing the SDF forces dancing, refused to attend the ceremony and waited outside. The Syrian regime has remained conspicuously silent over one of the most high-profile victories against ISIS, focusing on its own Russian-backed offensive in the eastern province of Deir Ezzor. Some of the SDF fighters who fought in Raqa have already redeployed to Deir Ezzor to join a rival US-backed offensive in the province, a spokesman said. At least 16 civilians including several children were killed in air strikes in Deir Ezzor on Thursday believed to have been carried out by Russian jets, the Observatory said. Some of them were trying to cross the Euphrates river near Albu Kamal, on the Iraqi border, one of ISIS' last remaining strongholds, the monitor said.